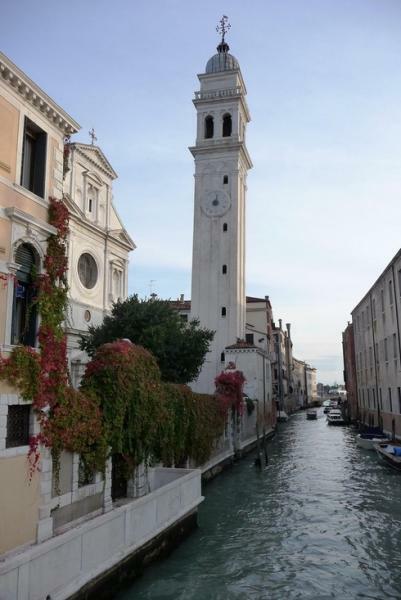 In the 1530s, the Greeks (who until then had been holding their services in San Biagio) were given permission to build an Orthodox church in Venice, which was funded by a special tax levied on all Greek ships arriving in Venice. Still active, the church in 1991 was proclaimed the Orthodox Cathedral of Italy. The Greeks hired Sante Lombardo to design San Giorgio, with a very fine Renaissance façade and a lovely clock on its perilously listing campanile, which ever since its construction in 1592 has hung like a diver about to leap into Rio dei Greci (a little loggia was added at its base to keep it upright). Inside, the most precious icon, of Christ Pantocrator, dates from the 14th century and was brought over by one of the Byzantine princesses who took refuge in Venice. Some of the finest icons, including 18 by the renowned 16th-century Cretan artist Michele Damaskinos, are part of the shimmering golden iconostasis; the older icons were brought over after the fall of Constantinople. Longhena's monument to Gabriele Seviros is his first known work. Longhena also designed the adjacent Scuola di San Nicolò dei Greci, now the Museo delle Icone; originally there was a convent and hospital as well. Don't miss the well head in the pretty courtyard, decorated with scenes of St George and the Dragon.